Baylor>Department of Religion>Our Faculty>Faculty>Rosalie Beck, Ph.D.
Rosalie Beck was born into a Southern Baptist family in the city of Amarillo, Texas, in 1949. Because her father, Edward Oran Beck, was a career Marine, she spent her childhood and youth living on both coasts and in Hawaii. Her older brother Joe and her younger brother Jim provided company, and her mother, Margeret Camden Beck, and her dad provided stability. After earning a B.A. in biology at the University of California at San Diego, Beck moved to Houston to work as a biochemist at the University of Texas Medical School in the Department of Biochemistry for two years. In 1973 she entered a short-term missionary program of the Southern Baptist Convention and served as a youth worker in Asia. In 1976, Beck entered Southwestern Baptist Theological Seminary in Fort Worth, to earn a Master of Divinity degree. She majored in church history. After graduation, Beck moved to Waco, Texas, to pursue a Ph.D. in religion at Baylor University. She completed her degree in August 1984 and joined the Baylor faculty beginning that Fall. 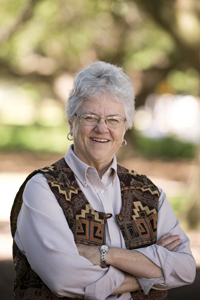 She was the first woman professor in the Baylor Department of Religion. Beck maintains the goal of teaching church history to help students understand how their belief system took shape, to help them know what they believe, and to enable them to understand how their beliefs apply to daily life. She strives for better ways to teach students and to excite them about the history of Christianity. Beck encourages students to engage all of their abilities when learning about the Church, the faith, and God. "Signs of Peace and Sanity: Baptist Women and World War II." Baptist History and Heritage 36 (Summer/Fall 2001): 44-56. "Response to ‘The Ordination of Women Among Texas Baptists' by Ann Miller." Perspectives in Religious Studies 29 (Fall 2002): 289-293. "William Carey: Plodder for Christ." In Turning Points, edited by Michael Williams and Walter B. Shurden. Macon, GA: Mercer University Press, 2008. A Community of Scholars: A History of the National Association of Baptist Professors of Religion. Macon, GA: National Association of Baptist Professors of Religion, 1999. Edited: McMurry, Mildred. Spiritual Life Development. Birmingham: Woman's Missionary Union, SBC, 1994.